WATCH PAUL PERFORM ACOUSTIC VERSION OF ‘WIDE OPEN SPACE’ LIVE ON RADIO 5. AVAILABLE FOR A LIMITED TIME ONLY! Former Mansun frontman, Paul Draper, made his first appearance on BBC Radio 5 on Sunday 10th June, when he appeared on the arts programme ‘Will Gompertz Heat Map’. 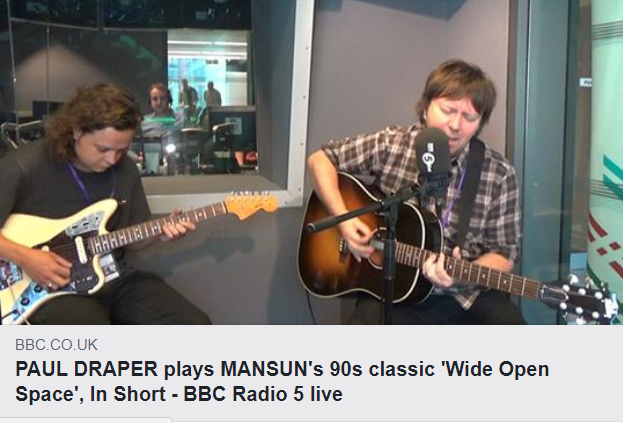 You can watch a video of Paul performing an acoustic version of the Mansun classic ‘Wide Open Space’, with his guitarist Ben Sink, on the BBC website HERE . The video is available for the next 29 days only.